This function is used to enter the record of a resource into the system. Select Branch of the resource. Shared Branches refers to branches that share the same resource. This is to allow users of other branches have access to the resource. Enter Resource Code, Resource Name and Resource Description accordingly. Share or Non Share refers to whether the resource is share among branches. 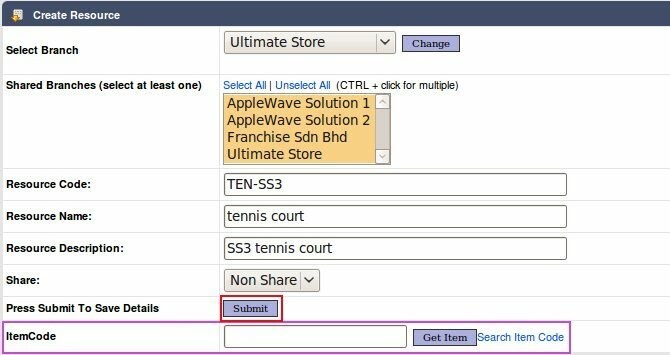 Click 'Submit' to get the Item Code field. Click to search for the Item Code. The list price of the Item Code is used in the calculation for the rental. Enter a keyword to search for the item. Click on the item code to select it. Click on 'Get Item' after selecting the Item Code. The Item Details will appear. After checking on the information entered, click 'Create Resource' to save it in the system.